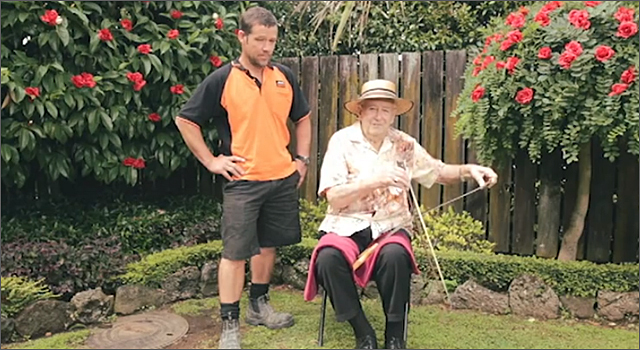 New Zealand hardware store Mitre 10 and ad agency DraftFCB are helping customers celebrate Valentine’s Day by demonstrating how to create DIY love songs using just a handsaw and a bow, or even a plastic coat-hanger if that’s all you have. Demonstrating his musical skills in the video is Auckland retiree and 2-time saw world champion Alan Pitts. Pitts first heard the haunting sound of the hand saw on the radio in the 1930s, inspiring him to develop his own virtuosity over 70 years, even playing with the New Zealand Symphony Orchestra in Tim Finn’s ‘The Saw and the Tree’. I would have loved to see this campaign expanded to encourage saw-playing contributions from customers, store managers and employers. As for music selections, I would suggest “I Saw Her Standing There”, “The First Time Ever I Saw Your Face”, or as suggested in the video, anything by The Carpenters. Coca-Cola’s worldwide Happiness campaign made a stop at one of the busiest shopping malls in Istanbul this past Valentine’s Day. The special coke vending machine featured secret cameras and was remotely operated and designed especially for couples. However, to get it to work people would have to choose they were a couple by sneaking a kiss or hugging. The experience was created by Instabul agency C-Section. Google rarely disappoints when it comes to creating a custom version of their logo for special days, and the Google doodle for Valentine’s Day is no exception. 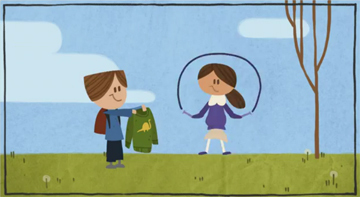 A young boy uses the search engine trying to find that special something to impress a little girl. I really thought she’s go for that dinosaur sweatshirt, but she returns to her skipping unimpressed. The animation was co-created by Michael “Lippy” Lipman with Google designer Willie Real, and features Tony Bennett’s 1951 recording of Hank Williams’ ‘Cold Cold Heart’, a number one hit on Billboard. It’s been a little over a year since Columbus Dispatch videographer Doral Chenoweth stumbled across the then homeless Ted Williams standing alongside traffic with a hand-written sign asking for donations. 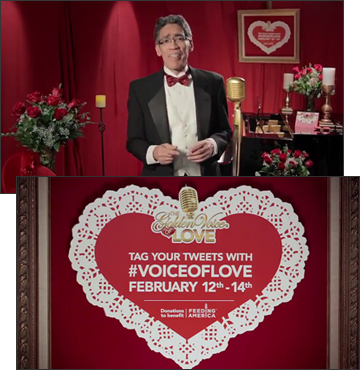 Now the smooth talking Ted Williams is ‘The Golden Voice of Love’ in a new Valentine’s Day campaign for Kraft Macaroni & Cheese. From February 12 to 14, Williams will be creating personalized videos in which he reads the best of user’s Valentine’s Day Tweets tagged with #VoiceofLove. 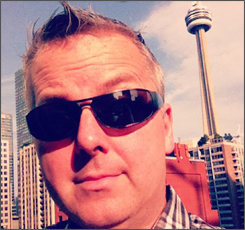 The video will then be posted to Kraft Macaroni & Cheese YouTube Channel and tweeted to Kraft’s Twitter profile. For every tweet tagged with #VoiceofLove Kraft will make a donation of 100 boxes of Macaroni & Cheese to Feeding America, up to 100,000 boxes. The campaign was created by Crispin Porter + Bogusky. 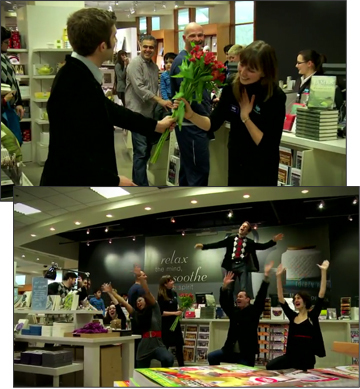 It seemed like just another day at the Bay & Bloor location of Indigo Books, until a young man carrying a bouquet of roses began singing ‘Happy Together’ to a what seems like an Indigo employee. The people at the store may have thought they were about to witness a very creative engagement proposal, until the man jumps up onto the counter and another half dozen performers join in on the performance. Just as things seemed to be over, a performer disguised as an author signing books stands up and begins singing the Stevie Wonder classic ‘Signed, Sealed, Delivered’ as he hands out gifts to startled shoppers. The performance with Calvin Harris’ ‘We Found Love’ and wraps up with Roy Orbison’s ‘You Got It’. It’s too bad that the ending comes off sounding so commercial with the song’s lyrics changed from ‘You Got It’ to “Anything You Want, We Got It”. But in the end it’s a promotion afterall. 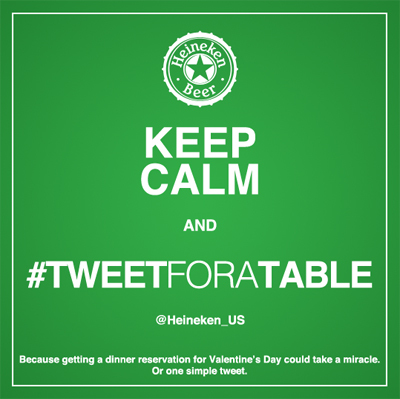 AT&T has enlisted the help of a group of very unconventional spokespersons for a special live Valentine’s Day event. A team of loud-talking mountain men will shout a special message to your loved one live from Mount Baldy, California. You can submit your message on the AT&T Facebook application now. On February 14th at 8am PST the Mountain Men begin live streaming their shouts live for everyone to follow, plus they will send each person selected a video clip link to pass onto their loved ones. But hey kids, keep it clean, as the site explains even grizzled Mountain Men have mothers too. The event will promote the new HTC Inspire 4G and I’m imagining the phone and its 4G capabilities will be featured prominently. The campaign was created by BBDO NY and features several hilarious video clips on the Facebook application and YouTube channel.